"...it wasn't long before the fun began in earnest." "Col. Hall's party was a real success. It started out with steaks in the mess hall at 1630. After that we all went to the club where the drinks were on him for the night. Due to the early start, the place was jumping by eight and it wasn't long before the fun began in earnest. The 335th and 336th ran the place. There was the usual amount of drink pouring and the like. Also, a bit of a war developed between the 335th and 336th over the signs that are over the bar. I think that the 335th started it, but we soon went back with more of the same. Col. 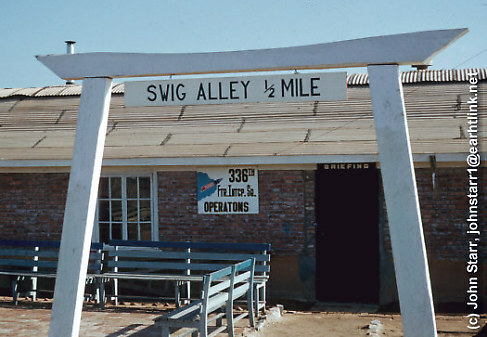 Miner was the first to strike a blow for the 336th when he leapt over the bar and grabbed the 335th sign. Unfortunately, very few of the 336th men saw it so he didn't have much interference on the way out. Mainly Capt. LeClaire and I did the blocking. Abel got the jeep and drove past Col. Miner as he was running down the road with the sign. He yelled for Miner to throw the sign and he did. But it went right through the jeep and landed on the road. At this point Miner threw a most beautiful block on Capt. Mozell; tossed him for a loop in the ditch. After that we decided that we would have to do better. Next time Voight went over the bar and grabbed the sign again. He ran off the north end and I went over the bar behind him to head off a man who was trying to come at him from the other end. We both went down in a pile, knocking bottles all over the place. Voight handed the sign to Maj. Hill, and we were off. Unfortunately, Hill got the wrong door when he tried to get out of the club and would up trapped against the one with no handle. He finally got through and heaved the sign on the roof of the club. Later on LeClaire made one last stab at the sign. He went over the bar and while the rest of us held off the 335th, he threw it on the floor and jumped on it. Col. Ballard was getting a little unhappy at this point. He kicked LeClaire out of the club (and a few more of us at the same time). LeClaire went to leave and was promptly kicked out again by Maj. Osworth. LeClaire told him that he had already been told to leave by a Colonel and so he, (Maj. Osworth) could go to hell. Osworth was a bit under the weather himself and was getting all huffy. Then LeClaire got on the wrong raincoat, grabbing some second lieutenant's by mistake. Osworth kept grabbing at his shoulder saying, "You're no second lieutenant." and LeClaire, not knowing what he was talking about was getting highly tee'd. I was standing by getting a big bang out of the whole affair, and that evidently got Maj. Osworth all the madder. He kicked me out, too. In fact, I think that everyone in the 335th and 336th got kicked out of the club at least once during the night. After making several rounds of the barracks making sure that no one was in the sack, we all went back to the club. Lowrey was there with no shirt on, having been dragged out of the sack by us. We had also gotten Maj. Hill out of the sack. He had known that we would be around and had tried to play it cool by getting into some else's bed. We just tore up all the sacks in Happy Valley until we came to the one where he was. Eventually Ballard closed the bar and everyone went on back to the BOQ's where the party went on into various hours."